Mike Ashley has won a court order preventing Rangers shareholders from voting to limit his influence on the club at the annual general meeting. 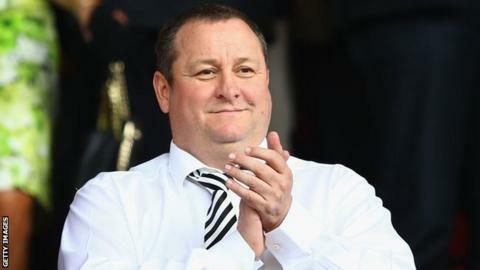 The Newcastle United owner controls a little less than 9% of Rangers shares, and the board wanted to remove the voting rights of shareholders with an influence in another club. That was in line with the Scottish Football Association's rule. But Ashley successfully blocked the resolution in the Court of Session. The AGM of Rangers International Football Club (RIFC) will be held at Glasgow's Clyde Auditorium on Friday. Shareholders will still be able to vote on resolutions to grant directors the right to allot new shares in the company. RIFC said it would "now consider how best to proceed". Rangers and Ashley were fined by the SFA earlier this year for breaching "dual ownership" rules. The SFA does not allow any individual to hold positions of influence in two clubs, but had agreed to Ashley holding a limited stake in RIFC if he did not seek to influence boardroom decisions at Ibrox. Since taking over as chairman, Dave King has sought to address the nature of the club's commercial relationship with Sports Direct, the retailer in which Ashley holds a majority stake. He faces a High Court appearance after being accused of breaching the terms of an injunction order granted to Sports Direct to prevent Rangers directors from discussing the retail deal in public.